Turner T, Steele E, Mavergames C, Elliott J. Facilitating Web-Based Collaboration in Evidence Synthesis (TaskExchange): Development and Analysis. JMIR Res Protoc. 2018 [cited Dec 13]; 7(12):e188 http://doi.org/10.2196/resprot.9285. Elliott J, Turner T, Synnot A. What role for consumers in the new health evidence ecosystem? Health Voices, Issue 22, April 2018. Byron C Wallace, Anna Noel-Storr, Iain J Marshall, Aaron M Cohen, Neil R Smalheiser, James Thomas; Identifying reports of randomized controlled trials (RCTs) via a hybrid machine learning and crowdsourcing approach, Journal of the American Medical Informatics Association, Volume 24, Issue 6, 1 November 2017, Pages 1165–1168. Singh G, Marshall IJ, Thomas J, Shawe-Taylor J, Wallace BC. A Neural Candidate-Selector Architecture for Automatic Structured Clinical Text Annotation. InProceedings of the 2017 ACM on Conference on Information and Knowledge Management 2017 Nov 6 (pp. 1519-1528). Elliott JH, Synnot A, Turner T, Simmonds M, Akl EA, McDonald S, Salanti G, Meerpohl J, MacLehose H, Hilton J, Tovey D. Living systematic review: 1. Introduction—the why, what, when, and how. J Clin Epidemiol. 2017 Nov 1;91:23-30. Thomas J, Noel-Storr A, Marshall I, Wallace B, McDonald S, Mavergames C, Glasziou P, Shemilt I, Synnot A, Turner T, Elliott J. Living systematic reviews: 2. Combining human and machine effort. J Clin Epidemiol. 2017 Nov 1;91:31-7. Simmonds M, Salanti G, McKenzie J, Elliott J, Agoritsas T, Hilton J, Perron C, Akl E, Hodder R, Pestridge C, Albrecht L. Living systematic reviews: 3. Statistical methods for updating meta-analyses. J Clin Epidemiol. 2017 Nov 1;91:38-46. Akl EA, Meerpohl JJ, Elliott J, Kahale LA, Schunemann HJ, Living Systematic Review N. Living systematic reviews: 4. Living guideline recommendations. J Clin Epidemiol 2017 Nov 1;91:47-53. Turner T, Green S, Tovey D, McDonald S, Soares-Weiser K, Pestridge C, Elliott J. Producing Cochrane systematic reviews—a qualitative study of current approaches and opportunities for innovation and improvement. Systematic reviews. 2017 Dec;6(1):147. Mavergames C, Elliott J. Living Systematic Reviews: towards real-time evidence for healthcare decision making. BMJ Clinical Evidence Blog. 2016. Turner T, Elliott J for the Project Transform team. 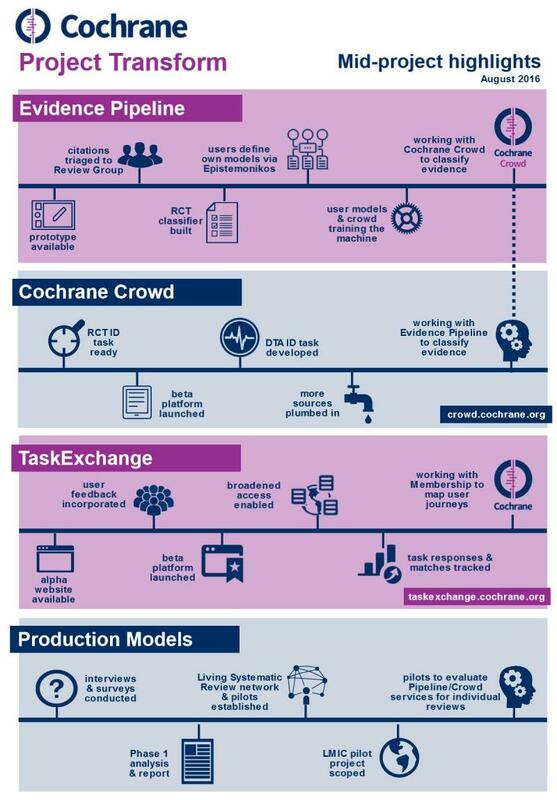 Production Models for Cochrane Reviews: How are we producing reviews? What works? What could we improve? London (UK): Cochrane. 2016. Elliott JH, Grimshaw J, Altman R, Bero L, Goodman SN, Henry D, Macleod M, Tovey D, Tugwell P, White H, Sim I. Informatics: Make sense of health data. Nature. 2015 Nov 4; 527(7576): 31-32.